Selected and narrated by Don Capps, U.S.A. When the grid lined up at Silverstone on race day, there was a crackle of tension in the air. Sitting on pole was a Ferrari driven by Argentinian Froilan Gonzalez, with fellow Argentinian Juan Fangio alongside in his Alfa. Filling out the front row were Farina in an Alfa and Alberto Ascari in another Ferrari. Ferrari had captured its first pole position, of what would be many. 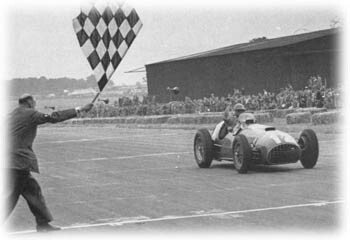 When the flag dropped, the leader into the first corner was the Alfa Romeo of Felice Bonetto from the second row. On the second lap Gonzalez nipped past for the lead only to be passed by Fangio on lap 10. However, despite pulling out all the stops, Fangio simply could not shake Gonzalez; nothing Fangio did seemed to work. Fangio really began to push harder and harder. Fangio, usually the most polished of drivers, was pushing so hard that he was touching the marker barrels and hay bales that lined the course. Yet, there was Gonzalez, still in his rear view mirror. Behind the battle for the lead, a real dog fight was taking place between Ascari, Farina, Villoresi (Ferrari), Sanesi (Alfa Romeo), and Bonetto. Although the order changed almost lap by lap, it has largely been overlooked because of the duel for the lead. At the time, however, it was enough to keep the crowd on their feet. Then on the 38th lap, Gonzalez finally went by in the lead. The Ferrari pits went crazy! The crowd went crazy. At mid-distance, 45 laps, the Alfa team made their pit stops. This allowed Gonzalez to extend his lead to over a minute. However, Fangio still had the bit between his teeth and was ripping around the track at a frantic rate trying to reel in the Ferrari. The pace led to Farina and Ascari being numbered among the retirements. When Gonzalez pitted for the 1951 equivalent of a modern "splash-and-go," he offered the car to Ascari, the team leader, but was told to return to the fray. What was later referred to as a sporting gesture on the part of both drivers was only half right: it was indeed a sporting gesture on behalf of Gonzalez, but local regulations for the race prohibited driver substitutions and Ferrari was reluctant to press its luck. Then there was Gonzalez taking the checkered flag, Ferrari defeating Alfa Romeo for the first time. Although he drove an incredible race Fangio was a distant second, another Ferrari - Luigi Villoresi - was in third. Alfa Romeo, the best team since Grand Prix racing resumed after WW2, had finally been defeated. But, it went down swinging, beaten by a driver having a great day. A portent of the future was down in fifth place: a BRM actually survived to the end of a race for the first points earned in a British machine in the Championship. It was difficult to find a coherent account of the 1953 French Grand Prix in the many dailies and weeklies of the time: the journalists were so caught up in the race that many of them forgot their journalistic responsibilities and had to scramble to make their deadlines. It was that sort of a race. As one put it, "I shall not attempt to describe the final laps. The whole thing was fantastic. The crowd was yelling, the commentators were screaming." When the flag dropped for the start of the race, from the third row of the grid Froilan Gonzalez in his Maserati rocketed into the lead. He was starting on half-tanks, but even so it was still an staggering start. The first lap on the newly revised course saw the cars flash by on the first lap in a great mass of red with a few specks and blue, yellow, and green chasing Gonzalez. Behind Gonzalez there was a great dice going on between Alberto Ascari (Ferrari), Juan Fangio (Maserati), Mike Hawthorn (Ferrari), Luigi Villoresi (Ferrari), Giuseppe Farina (Ferrari), Onofre Marimon (Maserati), and Felice Bonetto (Maserati). This group was literally wheel-to-wheel and often wheel-within-wheel as they thundered around the circuit. The running order was constantly changing all around the track with positions at the finishing line not reflecting the order going into the Garenne straight or coming out of the Thillois hairpin. On lap 24, a few seconds after Gonzalez went past, a group consisting of Ascari, Villoresi, Hawthorn, Fangio, Farina, and Marimon went screaming by in more or less that order as a small mass. They were all battling and scrapping for position. It was a breathtaking display of drivers fighting as hard as they could, but doing so fairly. While the crowds were screaming, the pit crews were almost literally struck dumb by this display of wheeled warfare. One blink and that was that for the Maserati and Ferrari factory teams. Fangio then stood on it and moved into third place millimeters from the tail of the Ascari Ferrari. Just a lap short of mid-race, at 29 laps, Gonzalez pitted for fuel. Although it only took 28 seconds, he dropped all the way down to sixth place. The war for the lead was now led by Ascari, Hawthorn, and Fangio. They passed the pits absolutely dead level on lap 35. Behind them it was now Farina, Marimon and Gonzalez. Hawthorn managed to draw out a slight lead over Fangio by lap 38. Meanwhile, Fangio was now worried about Gonzalez who managed to pass not only Marimon and Farina, but a surprised Ascari as well. The string of cars continued to scream around the track nipping at each other's heels trying to pass each other. The lap record was taking a pounding, being lowered on almost each lap. Suddenly, Marimon was out but Villoresi was now moving up to assume the challenge to Farina. At the front, Fangio was gaining on the Ferrari millimeter by millimeter, but Hawthorn was not making it easy. The last several laps were a frenzy of cut and thrust by Hawthorn and Fangio with Gonzalez just a teeny fraction behind them. They passed the finish line in a dead heat virtually every lap. On the last lap, they started it dead level as they roared towards the new Dunlop Bridge. At Thillois, Hawthorn managed to get just the smallest of leads on Fangio and held it across the line - with Gonzalez only 0.4 seconds behind and Ascari barely a dozen or so car lengths behind Gonzalez with Farina and Villoresi flashing across in short after that. This was Hawthorn's finest hour and it was a stupendous race. It would be a long time before there was another quite like it! Don Capps © 1999 Kaizar.Com, Incorporated.